Whenever you book a technology rental with a Technology Rental Agents from Rentacomputer.com, you will be given Frequent Reward Points or FRPs. So the more you rent, the more you will save! Each Point is worth $1 in discounts toward future rentals. All you need to do is create an account, and you will recieve 10 FRP points just for signing up! Renting with Rentacomputer.com starts paying off immediately, even on your first order! FRPs are not earned on delivery, labor, or taxes. FRPs may not be redeemed for cash. FRPs can be applied towards rentals and service only. Customer is responsible for any applicable taxes, if any. FRPs may not be used in conjunction with other discounts or promotions. FRPs are earned on the first survey filled out and cannot be earned again. For more information, check out our Frequent Reward Points page! 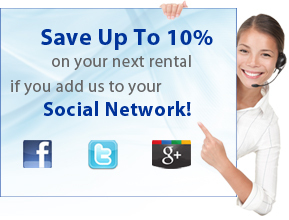 You can earn up to 10% savings on your next rental by adding us to your social network. Add us to Google+ or follow us on Twitter and earn up to 10%! After you like us on Facebook, watch our Wall for special offers. *Maximum discount of $500. Discount cannot be combined with any other offers, coupons, or specials. This is a one time discount. Earn 5% for liking us on Facebook, and 5% for following @TechnologyRent on Twitter and adding Rentacomputer.com to your Google Plus circles.